There is a misnomer that eating healthy and a night at the buffet do not match. However, buffets come with a vast array of foods in each important food group. Salads, vegetables, lean meats and seafood as well as a variety of fresh baked breads are available. There are some tips to practice with each buffet visit that will be as healthy as any meal. Take a trip around the buffet to see what is available. This will give you time to check things out as you target the healthy choices to eat. Beverages are as important as food items so consider the calorie count for each option. A caveat is to drink ice water with a side of lemon or lime. In addition, start drinking before you start eating. This will help fill you up as it controls portion size. Eat your meal in courses. For example, the soup and salad course will be first. Have a small salad with plenty of dark green leaves including spinach and kale. Top it off with olives, banana peppers, and other small veggies that add spice including salt content from the olives. This will eliminate the need for adding table salt. This is a known catalyst that leads to strokes. Use a coffee cup for the soup instead of a bowl. This is another portion control trick. Prepare a vegetable plate. While soup and salad have veggies, this is one food group where five or more servings are recommended. Eat loads of broccoli, corn, asparagus, and other choices including those you always wanted to try. Remember, to focus on the darker colored ones for more vitamins and minerals. Carbohydrates have received a bad rap over the years. They are an important food group. The key is to watch the type and amount. Gluten-free options are becoming more available including at buffets. Ask for those items. Otherwise, look for brown rice along with wheat, rye, and sesame breads. Most people love a pat of butter or margarine on their carbohydrates so look to see if the restaurant offers a substitute. The last tip is geared more towards enjoying restaurant experiences with friends and family. This means engage in conversation as you take your time to enjoy every bite. However, even if you go it alone, take a good read with you, or catch up with missed shows on a mobile device. Each restaurant that offers buffet meals, like Viejas, has a configuration where food groups have been separated. This is even the case with themed menus. For example, Mexican or Asian stations will have items sectioned accordingly. Although, meats and desserts were not mentioned, enjoy those as well. Eat baked and lean meats. 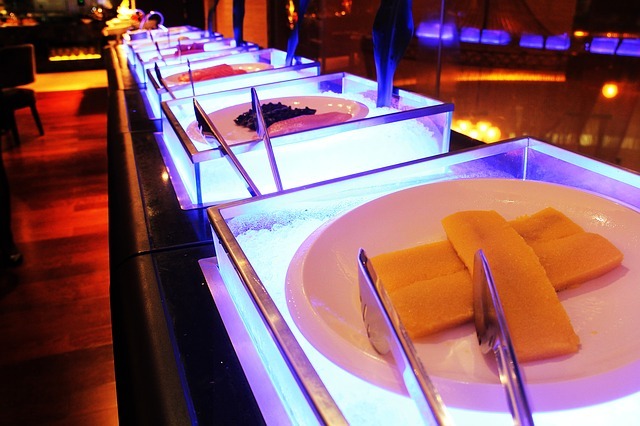 For desserts, try Jello, pudding, and fruits.